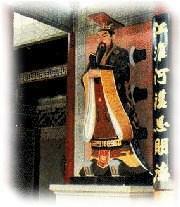 Emperor Xia Yu, founder of 1st Chinese Dynasty before 4,000 BC was said to be the descendant of the sixth generation of Emperor Huangdi.He left his footmarks all over China, trying to harness the big rivers like the Yellow River, Han River, Yantze River etc. He was revered as the very first to champion the quest in conquering nature. "Feng" or Wind and "Shui" or Water are the two most important components of Chinese geomancy. Between the two, Water was easier to study as it was on the ground and that China was also an agricultural society. The Chinese water classics records the different patterns of water courses. However, the "Feng" or Wind was difficult to study such as `Chi' or `dragons breath' cannot be seen with the naked eye. Water is an unpredicable force and a good Feng Shui Master must equally be well versed with the effects and have a clear understanding of "Water Feng Shui". Rule 1: Avoid buying a property with water BEHIND the house. Rule 2: The best place for a body of water is INFRONT of the house. 1. In the Book of Changes, Water symbolises difficulty. For example, underground water has been found to have adverse effect on a households living above it. Water is also an `upredictable' element and may contribute to weakening a foundation, flooding, landslides and termites etc.. Thus Feng Shui experts will usually ask you to avoid buying a property with water BEHIND it. This practice is consistent with notion that back of the house or `tortise' should have good support. The best place for a body of water? Is INFRONT of a house. 2. Avoid having a POND in the center of the house. For the case of a pool e.g. swimming pool infront of a house, it should be a `live' pool (with slow moving water) and not stagnant water. In the past, it was not advisable to have a well infront of a house as the well was said to contain `a well spirit' and thus bad Feng Shui.